Learn more about Madison, Wisconsin using the City Guide below. Plan a trip, find local shopping centers, or just discover what makes Madison, Wisconsin so great! Situated on the isthmus between Lake Mendota and Lake Monona, Madison is the capital of Wisconsin and is in the south central part of the state. Madison is a vibrant small city in south-central Wisconsin. The only city in North America that is situated on an isthmus, Madison is defined by its four lakes: Mendota, Monona, Waubesa, and Kegonsa. Through a combination of factors, including the state capital and the University of Wisconsin–Madison, the city has more to offer than might be expected from a metropolitan area of about 500,000. There are many excellent restaurants, an active theater community, lots of music, and good shopping, yet Madison is just minutes from the beautiful rural countryside. National groups and magazines rank Madison highly for many things: a very bike-friendly city, a great place to raise a family, a healthy and fit population, and an overall excellent place to live. Madison is a melting pot of the Midwest. You'll find professionals, students, families, hippies, musicians and everything in between. It has a vibrant nightlife scene with lots of live music and pubs. It shares many qualities of bigger cities like Berkeley and Austin—a creative and educated population—but retains a small-town feel. Madison's weather is typical of the Midwest: warm and humid in summer, often very cold in winter, and temperate spring and fall conditions. Dane County Regional Airport,MSN, Located northeast of downtown Madison, it is just a 15 minute ride to the Capitol and the University. There are many daily flights to nearby hubs including Chicago, Detroit, Minneapolis, and Denver. American Airlines, flying as American Connection. Northwest, flying as Mesaba, Pinnacle, and Northwest. I-39/I-90/I-94 runs by the eastern edge of Madison. Just over an hour to get to Milwaukee on I-94. Two hours and fifteen minutes to get to Chicago O'Hare Airport on I-90. Downtown Chicago is 30-45 minutes further, depending on traffic. Four hours on the combined I-90/I-94 will take you to Minneapolis/Saint Paul. From Chicago the VanGalder Bus can take you from Downtown Union Station, O'Hare, or Midway Airports to Memorial Union on the campus of the University of Wisconsin. Tickets are about $25 for a one way trip and they can be bought from the bus drivers for exact change, or with credit cards, check or cash at the Memorial Union Travel Center. From Milwaukee the Badger Bus runs multiple trips per day between Madison and Milwaukee, as well as stops in between. By bus. You can get around much of Madison on the Metro bus system. By car. Parking in the center of Madison - the isthmus - tends to be scarce. Parking further from the center is plentiful and free. A map of parking garages, rates, and parking regulations in the downtown area can be found at the City of Madison Parking page. By taxi. There are a variety of cab companies and when downtown there is never a taxi far from sight. By bike. Madison has consistently been rated as among America's most bicycle-friendly cities. Map of Madison's bike paths. Olbrich Botanical Gardens are free, except for the $1 Observatory price. The gardens have many ponds and greens, as well as the only Thai Pavilion in the continental United States. State Street, The core of the city is State Street, which extends from the Capitol Building west to the UW campus. This is the center of the bustle in Madison and is a must visit. You will find unique shops, restaurants, bars, sidewalk cafes, museums, street performers and lots of smiling faces. The Memorial Union, 800 Langdon Street, A lovely terrace which overlooks beautiful Lake Mendota. Beer, soft drinks, and fast food are available. Be sure to sample the Babcock Ice Cream. This renowned ice cream is made at Babcock Dairy Hall, and profits help fund the UW-Madison dairy program. In addition, the Memorial Union is one of very few campus unions to serve beer. They have a wide variety including local and regional brews that are a wonderful compliment to the music and company on the terrace or in the Rathskeller. Monona Terrace, 1 John Nolen Dr, From the roof of Monona Terrace, one can see views of downtown Madison, including the Capitol and a panoramic view of Lake Monona. There are also weekly events during the summer, including Dane Dances, concerts on the rooftop, and free Tai Chi. Overture Center, 501 State St, Besides being the venue for some fabulous shows, the newly constructed building is gorgeous and well worth the stop to look around as one meanders down State street. The Madison Family Theatre Company, Featuring great plays and musicals appropriate for the whole family. Token Creek Chamber Music Festival, An annual festival held every August featuring great classical music in an intimate, rural setting. Dr. Evermore's Forevertron. An impressive junkyard sculpture garden, about 20 miles north of town. Fantastical animals, futuristic devices and creepy bugs all made out of rusting scrap metal. Tour the state capitol, A lovely building in the middle of Madison. Olbrich Botanical Gardens, 3300 Atwood Avenue, A lovely place to visit. UW Madison Geology Museum, 1215 West Dayton Street. Wisconsin Veterans Museum, 30 W. Mifflin Street, Located downtown on the Capital Square. The State Street Pedestrian Mall, Stretching from the University of Wisconsin campus to the State Capital this is a great place to walk, shop, and eat. Just catch a bus if your legs get tired, because State Street is not just for pedestrians. The Dane County Farmer's Market, An outdoor market open Satudays from April through November, around the capital square. It's enormous and fantastic: more local produce than you can imagine. (Very Crowded, but a great veiw with genuine farmers!) There is also an indoor market in the Monona Terrace during the colder part of the year. East Towne Mall, A standard shopping mall on the east side of Madison, not far from I-39/I-90/I-94. West Towne Mall, A standard shopping mall on the west side of Madison. University of Wisconsin-Madison, Located in the center of town the university has been in operation since 1848, and more than 41,000 students are enrolled each year. Edgewood College, Located on Lake Wingra near the UW-Madison Arboretum, Edgewood College is a small, Catholic, liberal arts college. Madison Area Technical College, MATC has several campuses in Madison and surrounding communities and offers a variety of two-year programs as well as non-credit courses. The largest employers are the Wisconsin government and the University of Wisconsin. Additionally, there is a growing number of hi-tech employers and jobs, particularly in the bio-tech field. Madison has very low unemployment compared to the national average. Michelangelo's Coffee House, 114 State St, 251-5299. 7AM-11PM daily. Sandwiches, pastries, coffee and other drinks make up the menu at this comfy downtown meeting and reading spot. L'Etoile, Considered by some to be the best restaurant in town. While pricey, it is worth it. Make reservations in advance. Harvest Restaurant, Located right next door to L'Etoile it is nearly as good and is more likely that you can get a reservation on the same day. Madison Sourdough Bread Company, Excellent, fresh sourdough bread can be found here. Try their baguette--it is artisanal bread at its best. It can be found at some local grocery stores, including Willy Street Coop. Ella's Deli, 2902 East Washington. A great place to take kids, and adults will have fun too. The entire restaurant is decorated with animated toys, and about half of the tables have glass tops that allow you to look at interesting things, including a running model train, a baseball card collection, and much more. Their ice cream is excellent, their pastrami is unbeatable, and it's all kosher. Sandwich sizes are often smaller than one would expect from a kosher-style deli. Mickies Dairy Bar, 1511 Monroe Street, (608) 256-9476. A classic diner close to the University, and right across from the football stadium. It has excellent food and arguably the best shakes in town. If you think you can eat a lot, try the scrambler. Weary Traveler, 1201 Williamson Street, (608) 442-6207. A great local bar/restaurant that's consisently packed with friendly locals from the Willy St Neighborhood. Don't forget to try their speciality: the Bad Breath Burger. Nam's Noodles, 1336 Regent Street, (608) 287-0475. Excellent Vietnamese and Chinese food and is located close to the University. Very good pho and their "Nam's Fried Rice" is outstanding. Sit-down or take-out, no delivery. It's hard to find a bad item on the menu. Greenbush Bakery, 1305 Regent Street, (608) 257-1151. Very good doughnuts, which happen to be kosher. Vientiane Palace, 151 W Gorham Street, (608) 255-2848. Just off of State Street, the best Lao-Thai food in town. Great curries and noodle dishes. Ian's Pizza, 319 N Frances Street, (608) 257-0597. Very good pizza by the slice. Old standards like pepperoni, and new variations like mac and cheese. Great Dane Brew Pub, 123 E Doty St., A very large selection of hand-crafted microbrews and excellent food. Angelic Brewing Company, 323 W. Johnson St, (608) 257-2707. Makes their own beer and has good food. Ancora Coffee Roaster, With four locations around town, they have excellent coffee. Try the fabulous white coffee. Escape Java Joint, 916 Williamson Street. Located in the Willy Street neighborhood, just outside of downtown. Free wireless internet access and lots of seating if you need to settle in for a bit. Victor Allen's Coffee, Several locations around town; another popular local coffee roaster. Village Bar, 3901 Mineral Point Road, across the street from the Glenway Golf Course. This friendly neighborhood bar dates back over 65 years when Westmorland was a village outside the City of Madison. The fried summer sausage sandwiches are great. Best Western InnTowner and The Highland Club, On the west side of the UW campus in a quiet neighborhood, and just a short drive from State Street. Free wireless high-speed Internet and shuttle. It's concierge-level floor, The Highland Club, won Best Western's "Best of the Best" design award for its renovation . Doubletree, Located close to the University and not too far from the capital. It has free wireless Internet access. It used to be the Howard Johnson. Best Western Inn on the Park, 22 S Carroll Street, (608) 257-8811, A nice hotel, conveniently located right across from the capitol. GrandStay-Madison, 5317 High Crossing Blvd, (608) 241-2500 (877) 388-STAY. Combines the comforts of home with the services of a grand hotel to make your stay as relaxing as possible. Grandstay's "home away from home" atmosphere may make you never want to leave! Microtel Inn & Suites Madison, 2139 E. Springs Drive. Tel: (608) 242-9000. A Great Room at a Great Price. HI-Madison Hostel, 141 S Butler St, 608 441-0144. Closed on Thanksgiving Day, Christmas Eve, and Christmas Day. Countryside Apartments, 2801 Coventry Trail, (608) 271-0101. Short-term housing in apartments with one to three bedrooms. They also provide rental cars. Overall Madison is a very safe city. Safer than most. You can pretty much walk anywhere in the downtown area at night without the risk of anything bad happening. However you should always be cautious and be aware of your surroundings. The only areas that are recommended to avoid at night are isolated bike paths, Allied Drive, and Park Street. Madison is a very fun and safe city. The most uncomfortable situation you will normally come across is a college student that has had a bit too much to drink. Devil's Lake, The most popular of Wisconsin's state parks, Devil's Lake is about an hour northwest of Madison, south of Baraboo. It includes miles of hiking trails, some of them on bluffs of morraine overlooking the lake. The lake itself was created by the leading edge of the Wisconsin glacier, about 10,000 years ago, which also diverted the course of the Wisconsin River. The park has two pleasant beaches, and you can hike, bike, boat, swim, climb, hunt, or fish. It can be a bit crowded in the summer. Mustard Museum, Located in Mount Horeb, about twenty miles west of Madison, they sell over 800 varieties of mustard, all of which you can sample. They have more than 4,100 varities on display. Stop at the Grumpy Troll brewpub for a beer. Spring Green is home to a pair of architectural wonders: the House on the Rock, one of the weirdest museums you'll ever see, and Taliesin, the family home and architectural school founded by famous architect Frank Lloyd Wright. It's about 45 minutes west of Madison. Cedar Grove Cheese, A fun dairy about 30 miles west of Madison. Not only are they one of the oldest dairies in the area, but they make excellent cheese and they purify their own water using a Living Machine. Prairie Du Sac hosts the annual Wisconsin State Cow Chip Throw every Labor Day Weekend. Travelling to or from Madison, Wisconsin? 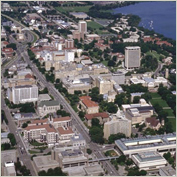 Find flight to or from Madison, Wisconsin with an Online Travel Agency. Get lodging information or make reservations with a Local Online Hotel. Plan ahead and reserve a car with a Local Car Rental Agency. Are you relocating to Madison, Wisconsin? Goods & Services in Madison, Wisconsin.